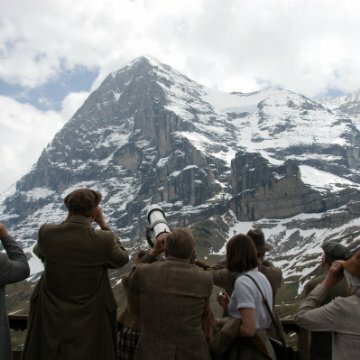 As Luise Fellner and her boss, Herr Arau, arrive at the Eiger, the local guides are standing in front of the hotel advertising their services to the tourists. One of the guides notices a pair of climbers in the crowd. "Look who's coming," he says, "Bartolo Sandri and Mario Menti." A fellow guide mutters: "Another couple of fools. Come in a train and leave in a coffin." These two Italian climbers fell to their deaths from the north face June 21, 1938. 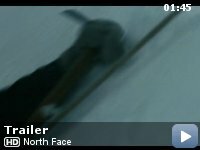 Errors made by characters (possibly deliberate errors by the filmmakers): At the beginning of the film, when Luisa watches the news in the cinema theater, the voice-over gets the first-names of the alpinists who died on the Eiger wrong. It says Max Mehringer and Karl Sedlmayr, but it's the opposite: KARL Mehringer and MAX Sedlmayr. This may have been intended to show the unreliability of the report. Luise Fellner: [voiceover] When you're at the bottom - Toni once told me - at the foot of the wall, and you look up, you ask yourself: How can anyone climb that? Why would anyone even want to? But hours later when you're at the top looking down, you've forgotten everything. Except the one person you promised you would come back to. 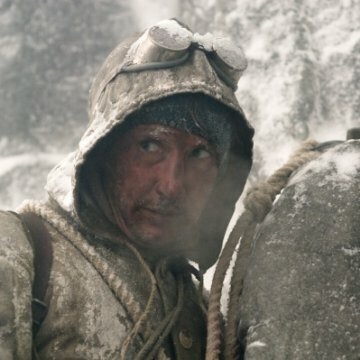 The reaction this film got at the Pusan International Film Festival (PIFF) in Pusan, South Korea, was better than any of the other big movies there. This movie gets a 10 out of 10 from me. It is a harsh story about Germany in the 30s as the Nazis were rising and wishing to prove to the world that they were the best. 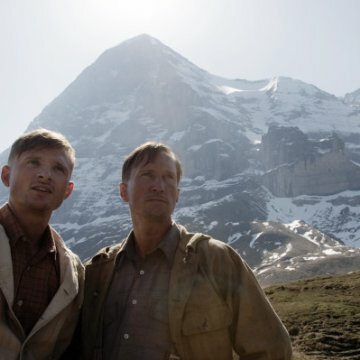 The tale is about two German men who take on a very difficult climb. The story is quite riveting, and human. Full of laughs, tragedy, and ... a little bit of a love story. Although the movie starts a little slowly, it really picks up about one third the way in. 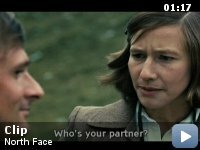 The main characters (the two mountain climbers and the one female love interest) are all solid actors, well directed, and well casted. 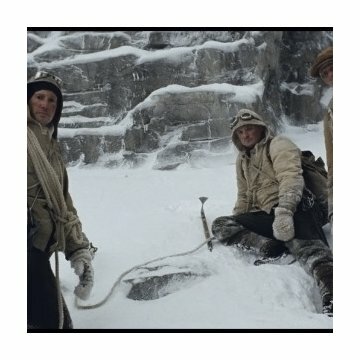 The director did a great job at capturing the climb. 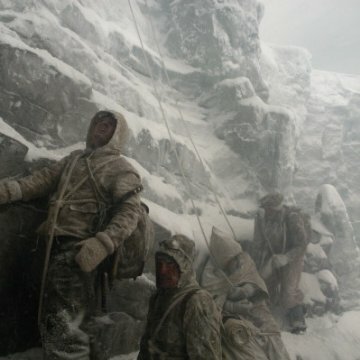 Everything was so convincingly shot, it makes you wonder if they actually filmed some of it on a real mountain. I suppose they must have used CGI, but it was used so sparingly and realistically that it must be commended. 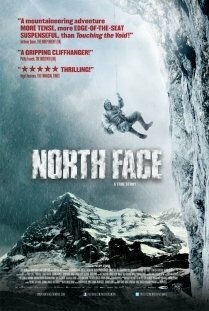 The contrast between the plight of the mountain climbers and that of the rich bystanders makes the movie so much more emotionally riveting. Some people in the audience cried. This is a tragedy that must be seen. It captures humanity at its best and worst... and shows us that sometimes nature rules our lives, and that it is not forgiving. 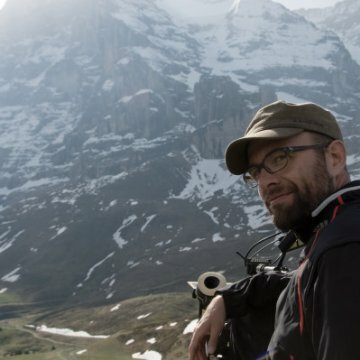 It was especially amazing to know that you, as the viewer, had more than a telescope to watch this climb with... unlike the bystanders in the movie, we were able to see more than just the ascent and the final moment. 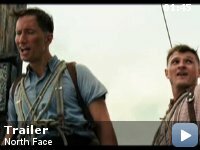 We saw the part that mattered the most: the climb.